SheerHopody Barn Dance Band (Ceilidh Band) for your Wedding, Birthday Party or Anniversary in Devon, Cornwall, and Somerset. 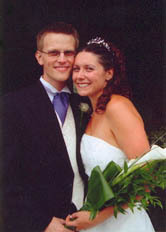 "The Kings of English Ceilidh"
A Barn Dance (or 'English Ceilidh') is a great way of celebrating your special occasion. 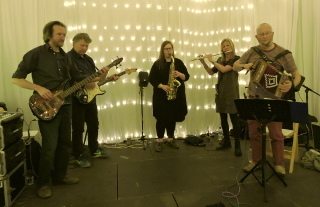 Let our lively, Devon-based ceilidh band entertain you and your guests with a wide range of 'up-beat' English folk music, while our 'caller' leads you through the steps. You can't go wrong? Oh yes you can - and all the more fun for everyone! If you've been to a barn dance before, you'll know that this really is the way for all your guests to enjoy themselves. No-one need get left out: mixing is guaranteed. All much more friendly than a disco (though many of our clients choose to have a barn dance first, with a disco later). Our ceilidh bands are available in four different 'flavours', so whether you're looking for a 'traditional' barn dance, or a stomping english ceilidh, we have something for you. But whatever the line-up, we'll bring the best english ceilidh dance music to your event almost anywhere in Devon, Somerset, Dorset or Cornwall. Read more about the bands. Adrian Brayley was our original caller back in 1995, and he's still with us! With his hallmark gentle manner he'll guide you through each dance with good humour and patience. Whether expert barn-dancer or total novice, you'll find Adrian's amiable style and many years' experience the perfect guarantee of an excellent ceilidh. It certainly does! For us, the sound quality is as important as the quality of the musicians. Our carefully chosen, high quality modern equipment, coupled with good technical expertise, ensures that the overall performance is first class: good dance music should be loud enough to dance to but still be pleasant to listen to. We make sure of that! This really depends on when and where the dance will be and the size of band you choose. As a guide, a barn dance or ceilidh somewhere in the Exeter/Crediton area of Devon would cost £725 for a 5-piece line-up and caller. There are other options to suit your particular occassion and full details can be found on our Barn Dance Band Menu. Will we deliver the goods? Well, we've been doing barn dances and ceilidhs in Devon and beyond since 1995 and have never let anyone down or failed to meet their expectations. Indeed, on the contrary - read some of the comments from previous clients. Just a quick note to say a big THANK YOU for playing at our wedding. The music and dancing were brilliant... We had a fantastic day and have lots of lovely memories. Thank you for helping to make our day that extra bit special. We just wanted to say a huge thank you for your performance at our wedding at the Manor House. What a wonderful evening! Everyone had such a great time and so many of our friends and relatives are still talking about it - we have an awful lot of converts to barn-dancing!! You really did make it a wonderful party. We are happy to receive enquiries for corporate entertainment, product launches, team-building events, indeed anything where you need top quality folk musicians, with or without our caller. For booking enquiries, please use our online enquiry form.